"Can't Exclude The Possibility Of BioTerrorism"
Outbreaks of H5N1 have so far been confirmed in Moscow's Sadovod pet market and in five districts of the Moscow region; Domodedovo, Odintsovo, Podolsk, Naro-Fominsk and Taldom. More than 5400 Russians living in villages outside of Moscow are now being medically monitored for signs of having caught the avian influenza virus from at least eight small to large outbreaks of the H5N1 virus in village markets. Between 20 and 43 people are now under quarantine after having direct contact with poultry birds that are believed to have died from the virus. Russian officials began culling birds on February 9. An avian flu outbreak in the Moscow region over the weekend has been traced to a single market, a senior official said Sunday. The four cases of dead poultry involved birds that had been bought at a market located in southwest Moscow, Alexei Alexeyenko, a spokesman for the Agriculture Ministry’s animal and plant inspection agency, told The Associated Press. Alexeyenko said the market had been closed Saturday and that experts were working to pinpoint the source of the birds, the AP reported. A number of poultry farms around Moscow were placed under quarantine over the weekend after the authorities confirmed an outbreak of bird flu in the region. But some confusion surrounded the confirmation of the H5N1 strain, with officials contradicting one another. Television footage Sunday showed veterinary workers in protective suits checking homes in the district and spraying vehicle tires with disinfectant. Sitnikov said he was optimistic that further outbreaks of the virus in the Moscow region could be prevented. The Moscow region has offered a series of guidelines, including avoiding contact with wild fowl and only buying bird meat or eggs in official marketplaces. “I can’t exclude the possibility of bioterrorism. In that case, the Federal Security Service and other law enforcement agencies will have to be involved,” Sitnikov was quoted as saying by Ekho Moskvy radio. But Oleg Kiselyov, who heads the Federal Flu Research Institute, dismissed the idea that the flu could be linked to terrorism. He also said in an interview with Ekho Moskvy on Sunday that Russian scientists had already designed a vaccine for both humans and birds. The outbreak of bird flu in the Moscow region is the second case in Russia this year. Thousands of Russians were undergoing tests last night after an outbreak of bird flu at chicken farms on the outskirts of Moscow. Health officials confirmed that chickens at two farms within 30 miles (49km) of the capital had died from the H5N1 strain of the virus. Dead birds suspected of being contaminated were also being tested at three other locations near Moscow. “Medical monitoring is under way for 5,453 residents in the relevant areas, including 20 citizens who were in direct contact with the infected birds,” said Gennady Onishchenko, Russia’s chief epidemiologist. No illnesses had been reported among human beings so far, he said. This is the first time that bird flu has been detected so close to Moscow, which is home to more than ten million people. Officials established quarantine zones around villages in affected areas and began bird vaccination programmes. Veterinary officials have established that the bird flu virus came from chickens bought at a Moscow bird market. More than 150 birds have died at private farms around the city in the past ten days. Russia’s Interior Ministry ordered measures to prevent any possible spread of the infection. Police visited every house in the affected districts to seek information about possible sick birds, while road traffic inspectors were checking all poultry vehicles. A short, but comprehensive summary from Reuters on the spread of the avaian influenza virus around the world. The report makes clear that the spread of bird flu and the human toll is increasing, not decreasing. The outbreak of highly pathogenic H5N1 avian influenza began in Asia in 2003 and has spread rapidly over the past year. More than 30 countries have reported outbreaks in the past year, in most cases involving wild birds such as swans. The virus has killed 167 people since 2003, according to WHO. Countries with confirmed human deaths are: Azerbaijan, Cambodia, China, Egypt, Indonesia, Iraq, Nigeria, Thailand, Turkey and Vietnam. In total, the virus is known to have infected 273 people since 2003, according to WHO. Many of those who have died are children and young adults. Vietnam and Indonesia have the highest number of cases, accounting for 105 of the total deaths. The H5N1 virus is not new to science and was responsible for an outbreak of highly pathogenic avian influenza in Scotland in 1959. H5N1 is not the only bird flu virus. There are numerous strains. For example, an outbreak in 2003 of the H7N7 bird flu virus in the Netherlands led to the destruction of more than 30 million birds, around a third of the country's poultry stock. About 2.7 million were destroyed in Belgium and around 400,000 in Germany. In the Netherlands, 89 people were infected with the H7N7 virus, of whom one (a veterinarian) died. The H5N1 virus made the first known jump into humans in Hong Kong in 1997, infecting 18 people and killing six of them. The government ordered the immediate culling of the territory's entire poultry flock, ending the outbreak. TURKEY : Confirmation that the bird flu virus has returned to the south-east of the country, with three people being tested for the virus. Four children died of bird flu in Turkey in 2006. Ten villages have reported outbreaks. Hundreds of birds have been culled and some of the villages are now under tight quarantine restrictions. EGYPT : Two more human deaths from H5N1 have been reported, including a 5 year old. Egypt is now denying it is experiencing a far more deadly strain of bird flu than in 2006, when six people died in less than two months. 13 people have died of bird flu in Egypt so far. HUNGARY : A turkey farmed owned by the same company that saw an outbreak of the virus in Suffolk, England, two weeks ago, is now being blamed as the source of the virus. Contaminated turkey meat is believed to have been transported from the farm in Hungary to the Suffolk farm less than a month after an outbreak in Hungary was confirmed. The turkey farms owner, Bernard Mathews, is denying his company is responsible for spreading the H5N1 virus from Hungary to England. ASIA : Poultry is key to many celebrations and family feasts across Asia during the Lunar New Year, and bird flu experts are bracing for a fresh round of outbreaks of the virus as hundreds of millions of people go on the move, travelling great distances, and possibly carrying strains of the H5N1 virus in the poultry products they take with them as they travel. VIETNAM : Experts in Vietnam are claiming they have contained the spread of the H5N1 virus after a shocking string of outbreaks in 21 different locations. INDONESIA : The Indonesian government has reached an accord with the World Health Organisation over the international sharing of H5N1 virus samples. Indonesia stopped sharing such samples late in 2006, after an Australian drug manufacturer filed for a patent on a vaccine derived from an Indonesian strain of the virus. The Indonesian government demanded a guarantee from the WHO that poor countries would be given equal and affordable access to any and all bird flu vaccines recommended by the UN body in exchange for returning to sharing virus samples with researchers, a demand now met by WHO. RUSSIA : The presence of the H5N1 virus has been confirmed in at least poultry farms near Moscow. Tight quarantine restrictions have been imposed, and any farm workers who have been exposed to 30 birds or more have been hospitalised, "as a precaution". Moscow's chief veterinarian has claimed the outbreak may be the result of an act of "bioterrorism" and said the possibility can not yet be ruled out. He wants the Security Services to take over the investigation. A third outbreak has now been reported, but not yet confirmed. NIGERIA : Poultry traders in a number of markets say they will resist any further government-ordered culls of their bird stocks. Traders claimed that they were not compensated by the government after culls in 2006 and suffered substantial financial losses as a result. The US government has begun running public service announcements on TV and radio to raise awareness of the fact they are anticipating a full blown flu pandemic in coming years. The government's pandemicflu.gov website has expanded its resources recently, and now includes a Threat Level warning system, similar in style to that used for terrorism alerts. Today it sits at Phase 3 - "No or very limited human to human transmission". The US government is expecting at least one-third of the entire workforce to be off work during the course of a bird flu, or H5N1, pandemic. The grocery industry is officially listed by the US government as one of 13 "critical infrastructure" industries, meaning society can barely exist without it. But it is a key industry expected to suffer greatly during a pandemic. ....will fresh fruits and vegetables, meat, bread, milk and other household staples still be available if the U.S. is hit with an anticipated bird flu pandemic? If state and federal officials urge people to stay away from public places, like restaurants and fast-food establishments, will they be able to get the groceries they need to prepare food in their homes? Unlike other critical infrastructure sectors like water, energy and health care, the food industry isn't getting much help from state and federal governments when it comes to disaster planning. That puts the burden on individual supermarket chains and wholesalers to deal with a potentially large number of sick workers that could affect store operations and disrupt the food supply. ...if a pandemic emerges, the Department of Homeland Security projects worker absenteeism to reach 40 percent or more over a prolonged period. Hammonds said retail food stores would have to contend with worker shortages and disruptions in the supply chain. "Having those critical facilities open — like power, water, food — becomes very important" during a national disaster such as a pandemic, said Keith Hanson, an outreach coordinator for Nebraska's Center for Biopreparedness Education. One of the key problems cited by the Department of Homeland Security is that Americans are dining out substantially more now than they were a decade ago, which means average Americans have smaller supplies of non-perishable foods in their homes. The Food Marketing Institute's Hammonds said a widespread pandemic will likely cause food consumption to shift away from restaurants and fast-food establishments and toward in-home eating, causing a greater demand for groceries. "That means stores would need to be prepared for an increase in volume," he said. There will be a greater demand for grocery items during a pandemic, but less staff to deal with the increase in customers, and also very likely less groceries on the shelves, as the trucking of food supplies to non-city stores is expected to be greatly reduced. The US government is now advising Americans to stock up on non-perishable food supplies, enough to last family members a few weeks. A small solar powered battery recharger should be added to that list, seeing as they are becoming ubiquitous in camping stores. Keeping what I call a 'pandemic box' of supplies isn't a bad idea, regardless of the threat of a flu pandemic. You might never need to tuck into the supplies, but you're going to miss them all if you suddenly find yourself in a situation where the local shops are inaccessible, locked down, or no longer exist. As anyone who has endured the aftermath of major storms, hurricanes, cyclones, intense flooding, or even bushfires, can tell you, being able to survive without having to hit the local shops to get the basics for a few days, or a few weeks, can make all the difference in the world. Although the kinds of plans detailed below have been on the drawing board for the governments of the United Kingdom and the United States for at least two years, they are only now starting to creep into the mainstream media. The below excerpts provide a vivid insight into the kinds of chaos and madness pandemic planners are expecting will be seen in hospitals, quarantine centres and medical facilities. Doctors treating victims of avian flu may need security guards and even military protection to shield them from violent relatives should they be forced to choose which dying patients to treat and which to turn away during a pandemic, a government committee has warned. The elderly, patients who have long-term health problems and those who are least likely to survive will be at the end of the queue and might be denied life-saving treatment. The draft report by the critical care contingency planning group, a joint committee between the Department of Health and the Intensive Care Society, warns that relatives could resort to violence when they are told their loved one is not considered a high enough priority to receive care. Patients who would have been resuscitated in normal circumstances will be allowed to die. Others will be taken off life-support machines if they fail to show early signs of improvement. Contingency planning at its most ruthless but, presumably, necessary. However, the following report discusses research that claims older people may prove to be immune from becoming infected with the H5N1 virus. It also claims 90% of all bird flu infections in humans occured in persons under the age of 40. UK : Has Bird Flu Entered The Human Food Chain? A remarkably lacklustre approach from the British government following claims that H5N1 infected turkey meat may have found its way onto UK supermarket shelves. The relevant government department clearly states that infected turkey meat poses no threat to a human consumer, citing "no evidence" of people becoming infected with the virus in countries like Indonesia from eating poultry. And yet, the governments of Indonesia, Vietnam and China, along with the United Nations, issued stark warnings in 2005 and 2006 that any poultry that may have even come into contact with H5N1 infected birds should be cooked until there was absolutely no pink meat left. Even better, poultry meat should be boiled or steamed for twice or three times as long as normal. So why no such warning from the British government, or the Bernard Mathews company, on two of whom's farms (in Suffolk, England and in Hungary) H5N1 infected poultry have been discovered? Clearly, both entities would be aware of the procedures for cooking poultry issued by the governments of other (Asian) countries who've suffered outbreaks of bird flu. At the moment, at least twelve countries have been imports of poultry meat or products from the United Kingdom. The avian flu virus that led to the culling of 160,000 birds on a Bernard Matthews turkey farm may have entered the human food supply, Government food safety experts admitted yesterday. The Food Standards Agency (FSA) said it was investigating the possibility as part of a wider inquiry into the outbreak on the farm at Holton in Suffolk. There was no threat to human health, the FSA said. The most likely cause of the outbreak is now believed to be frozen poultry pieces imported from Hungary, which may have been contaminated with the virus, to a processing plant next to the Suffolk farm. Professor Sir David King, the Government's chief scientist said packaged turkey meat could be removed from supermarket shelves following the disclosure. "I think that is exactly what the Food Standards Agency will be looking at now," he told Channel 4 News. The FSA confirmed it was investigating but said it had no plans at present to recall turkey products. A spokesman said: "Even if infected poultry had entered the food chain, and we don't know that yet, it is not a human health risk. There is not one case round the world in which humans have contracted the disease from eating infected meat." As the scare threatened to engulf Bernard Matthews' £400m business in the UK, he postponed an appointment at Buckingham Palace where he was due to receive a CVO (Commander of the Victorian Order) from the Queen yesterday for his charity work. Earlier Professor King said the H5N1 virus identified in the outbreak was identical to the strain in the Hungarian outbreak on a goose farm in Szentes last month. Thousands of geese were destroyed. The "most likely scenario" was that the virus was brought into the UK by dead poultry rather than wild birds as had originally been thought, he said. Both the Environment Secretary David Miliband and a Bernard Matthews spokesman had previously ruled out any link with the Hungarian outbreak. Bernard Matthews has a processing plant at Sarvar in southern Hungary from where tonnes of poultry pieces - plucked, cut and frozen - are imported to the Suffolk plant each week. One consignment arrived a few days before 27 January, when the first signs of illness were seen among turkey chicks on the Suffolk farm. The outbreak on the goose farm in Szentes , Hungary, started on 19 January. Vets said the virus could survive for "several days" in a carcass and for longer if it was frozen. Speaking following a meeting of Cobra, the Government's emergency committee,the Environment Minister Ben Bradshaw said: "Bernard Matthews have been open with us about that but we need to investigate that further. We are investigating reports that there may have been some bio-security breaches at the plant." Is turkey, and other forms of poultry, safe to eat? The Food Standards Agency insists that it is. We do not know for sure that infected meat is on the supermarket shelves. Even if it is, infected poultry "is not a human health risk" when consumed, the agency says. The virus is transmitted from bird to bird through infected faeces and the gut. That cannot happen in humans - we lack the necessary receptors for the virus in our gut. What is the inquiry focusing on? Bernard Matthews, the company, has some very serious questions to answer about its bio-security - both in the UK and Hungary. If the virus was imported in infected poultry meat, as suspected, how did the poultry get infected in Hungary? One suggestion is that a slaughterhouse close to the outbreak of avian flu on a goose farm in Hungary, may provide a link. Once the frozen poultry pieces arrived at the Suffolk processing plant in the UK, how did the virus get from the plant to the sheds where the turkey chicks were being reared? Traces of the virus have been found in three of the 22 sheds. One theory is wild birds or rats could have eaten the infected meat and transmitted the virus to the sheds. Did the Government or Bernard Matthews withold information from the public about the outbreak? Both deny it. The company said that no live birds had been imported from Hungary but did not mention that poultry meat was imported. Ministers say they had been told that the imported poultry was from outside the exclusion zone imposed in Hungary around the outbreak on the goose farm and that "the importation of poultry from an EU country is a legitimate business. Considering that only last year the theory of domestic cats being able to carry and pass on avian influenza was regarded as widely held as being something close to Indonesia superstition, this recently reclassified 'fact' is now getting plenty of international media play. Cats should be kept away from areas affected by the deadly H5N1 bird flu virus as they can pick up and spread the disease, the United Nations' Food and Agriculture Organisation (FAO) said on Thursday. Cats at infected farms should be kept indoors, the agency said, as evidence from Indonesia and other countries showed they could catch bird flu from eating infected poultry or wild birds. The worst fear is that cats could become a host for the virus where it could mutate into a form that may cause a human pandemic, the FAO said. "Cats could act as intermediary hosts in the spread of the H5N1 virus between species," said FAO's Assistant Director-General Alexander Mueller. "(Virus) growth in cats might help the H5N1 virus to adapt into a more highly infectious strain that could spark an influenza pandemic." Indonesia Announces It Will Not Share H5N1 Virus Samples "For Free"
It's interesting to see how this story is being reported around the world. The linked story below seems reasonably balanced, unlike some others that strictly follow the WHO's songsheet on the issue : that Indonesia should openly share all samples of H5N1 and other avian influenza strains. Indonesia's position is reasonable enough. They claim that virus samples shared with researchers and pharmacuetical companies around the world could end being patented by one of the pharma giants, or a private research group, as a vaccine is developed, leaving Indonesia is the possible position of having to pay to create its own vaccines from an avian influenza virus that originated within the archipelago. As unreasonable as some claim Indonesia is being, it is not a situation created by Indonesia, but by the restrictive patenting of everything from unique human DNA to rare viral strains by pharmaceutical companies. A particularly interesting factoid from the article - Indonesia has a H5N1 virus that shows 70% mortality in infected humans, incredibly high for any virus, and "nobody knows why". The strains of the H5N1 virus circulating in Indonesia are considered crucial to developing up-to-date vaccines and following mutations in the virus. (A World Health Organisation official), Dr. David Heymann, said the agency was "clearly concerned" about the development and was in talks with Indonesia. Heymann, the agency's chief of communicable diseases, said he was not blaming the company involved, Baxter Healthcare of Deerfield, Illinois "But now that this has happened," he said, "we have to sit down and figure out how to rectify it." ...Indonesia's decision upsets the pattern for making seasonal flu vaccines — by choosing among hundreds of samples sent in voluntarily from all over the world — and could set a dangerous example for other countries. Indonesia and other poor countries feel slighted by the system — justifiably so, some experts say — because the samples they send in are used to produce vaccines that they often cannot afford. "Their concern," Heymann said, "is that their strains have been used by several manufacturers to produce vaccines, and that Indonesia should get some compensation. From their point of view, it's understandable." A spokeswoman for Indonesia's Health Ministry told Reuters Tuesday that the country "cannot share samples for free." "There should be rules of the game for it," said the spokeswoman, Lily Sulistyowati. "Just imagine, they could research, use and patent the Indonesia strain." The Financial Times reported the move by Indonesia Tuesday; the country has not released a flu sample since late last year. Some leading flu experts said they believed that Indonesia was acting on its own, not understanding the ramifications. "This is counterproductive — it will hurt Indonesia more than it hurts other countries," said Dr. Arnold Monto, an epidemiologist at the University of Michigan. "The WHO should be their biggest friend. Indonesia has a virus with a 70 percent case fatality, and we don't know why. If they want to work with the best laboratories in the world, they should make sure that virus samples can get out." Because flu mutates so rapidly, samples are normally gathered from all over the world. For seasonal flus, an expert committee meets each February to try to predict which three are the most likely to be a problem by October, when the Northern Hemisphere's flu season begins. The strains are usually rendered harmless by laboratories that consult with the WHO, and the genes responsible for the ability of the virus's outer coat to invade cells are spliced to older, well-known strains. Then this "seed virus" is given free to private companies that produce millions of doses. The arrangement was informal until the WHO started writing rules for it last fall. To assure countries like Indonesia a supply of vaccine, Heymann favors helping them get plants where they can produce it themselves at low cost. Straight out of Stephen King's The Stand. We won't know how close to the world came to the accidental release of a deadly strain of flu virus, because the virus didn't escape the lab. But it sure sounds like it came close. Last April, a researcher at the University of Texas, Austin, put tubes into a centrifuge to separate out their contents, which included a human flu virus modified to carry a gene from H5N1 bird flu. The centrifuge became unbalanced and stopped, and when the researcher opened it he found the lid of a safety cup holding one of the tubes had fallen off. Fearing that the tube inside had leaked, the researcher disinfected everything and called the lab's safety officers. He was wearing a protective hood and respirator, and the whole room was at negative pressure to prevent leaks to the outside. But the researcher had made one mistake: he opened the centrifuge and removed the samples without waiting the recommended 30 minutes to allow any virus-laden aerosol to settle. In fact, the tube was intact. But if aerosol had escaped, the consequences could have been serious, since the virus would have been able to infect humans, with unknown effects. Experiments since the accident show that the virus replicates more slowly in the lab than human flu, says Bob Krug, head of the Austin lab. But its behaviour in people might be different, and an escapee could also share its new gene with other flu viruses. The biosecurity of the UK will come under further hard scrutiny following revelations that a shipment of turkey carcasses between a poultry farm in Hungary and another farm in Suffolk, both owned by the same company, is the most likely source for the H5N1 virus that killed thousands of birds in only a few days. ...a consignment of turkeys, which had been partly processed, travelled by lorry from the Hungarian plant and arrived in the UK a few days before January 27, the date when farm workers began to notice the first signs of illness in the turkey chicks at the farm near Holton, Suffolk. A Whitehall source said there were concerns about bio-security at the processing plant, which lies adjacent to the Holton farm, where the infected birds were found. Officials from the Department for Environment, Food and Rural Affairs (Defra) are looking at allegations that scraps of meat are sometimes left lying around the floor of the plant and are scavenged by rats and wild birds, creating a possible route for infection. Defra was aware last Monday that a consignment of meat had been taken into the plant but it was not revealed to the public. The environment secretary, David Miliband, made no mention of it when he made a statement to the House of Commons that day. Nor was it revealed by Lord Rooker, the agriculture minister, in the Lords earlier today. Lord Rooker confirmed that there had been no importation of chicks or eggs into Britain, but did not mention the possibility that carcasses had been transported into the plant. British health officials also told the European Union last Tuesday they did not believe there was a link between the outbreak of bird flu at the Bernard Matthews farm and two recent cases in Hungary where Matthews also has poultry interests. The British and Hungarian outbreaks, the first in Europe for more than six months, occurred within days of one another. Officials in Brussels said no wild birds had been discovered bearing the virus, despite widespread monitoring. The Observer understands that the information about the meat consignment was considered by Defra officials to be 'commercially confidential' and a decision was initially taken not to put it into the public domain. The government confirmed earlier this week that the strain of the H5N1 virus which was identified in one turkey shed the previous Friday was the same strain found last month in Hungary, where an outbreak among geese on a farm prompted the slaughter of thousands of birds. A flock of 3,000 geese on the infected farm near Szentes in southern Hungary was destroyed last month after they were found to have H5N1. The virus first appeared in the country in February last year in wild geese, swans and domestic poultry. Britain's £3.4bn poultry industry, which produces 800 million birds a year, will now be under scrutiny. Defra has continued to investigate the movement of people and animals on and off the farm, including any links the farm may have had with Hungary, where there have been a series of outbreaks in the last month and where Matthews owns Saga Foods, the country's largest poultry company. His plant in Sarvar lies 165 miles from the recent outbreak in the south of the country, in Sventes. Stray, or wild, cats are slipping back into the news again in connection with the spread of H5N1, after the US Embassy told American citizens in Indonesia to avoid any contact with stray cats. “There have been confirmed reports that wild and stray cats have been shown to carry H5N1. While there have been no documented cases of feline-to-human transmission of H5N1, it is important to avoid contact with wild and stray cats,” it said. South Korean slaughtered hundreds, if not thousands, of stray cats late last year, at the same time it culled tens of thousands of poultry birds. During the H5N1-infected swan incident in the UK last year, reports hit the media that stray cats could not only carry the virus but might be able to pass it onto humans. On some news media discussion boards in the UK, such as the Daily Mail and the BBC, there was heated comment from cat owners about whether or not they would give up their cats during a cull to prevent the spread of H5N1. Most stated vehemently that they would not let their cats be culled, even if the animals posed a serious risk of infecting the owners. Mike Davis wrote a clear, precise and comprehensive book, 'The Monster At The Door : The Global Threat Of Avian Flu', that we should have reviewed here, and still might. 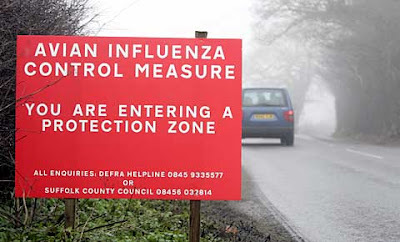 For now, Davis has a good piece up on the UK Guardian's 'Comment Is Free' site, about how avian influenza disappears and resurfaces, year in, year out, and why outbreaks in Indonesia are more worrying than 2600 dead turkeys in Suffolk, England. ...virologists have yet to understand avian flu's enigmatic behaviour: burning like a wildfire one season, going to ground the next. However, since the original outbreak in Hong Kong in 1997, one trend remains consistent: after each hibernation or disappearance, H5N1 re-emerges with its virulence intact and its geographical and species ranges extended. The World Health Organisation....is grimly mobilising to confront imminent worst-case scenarios. The proposed response remains the same as last year: rely on local early-warning systems to quickly identify sustained human-to-human transmission and then squelch it with massive saturation of the exposed population with the antiviral Tamiflu. This strategy is based on a dubious perfect-world model of pandemic emergence and medical response, and is overwhelmingly contradicted by the WHO's own recent experiences in the field. ...Tamiflu is no longer a magic bullet: several recent deaths in Egypt have been attributed to a Tamiflu-resistant strain and this resistance is likely to spread through the larger population of H5N1 subtypes. Second, the elaborate system of outbreak surveillance, immediate poultry slaughter, and isolation of human victims that has been painstakingly established in China, Vietnam and Thailand simply doesn't exist in many areas of recent outbreak, and will never come into being without a massive, urgent international effort. Davis describes the possibility of greater outbreaks in shanty towns in Nigeria, and across sub-Saharan Africa as "horrifying" and "virtually apocalyptic" , but reminds that Indonesia remains the most likely start point for a global pandemic. ...years of heroic work in Vietnam to contain an explosive H5N1 outbreak that most experts feared was the likely pandemic trigger have been more or less annulled by the rampant and preventable spread of the disease across Indonesia's thousands of islands over the past 18 months. This has been a defeat for the WHO's containment strategy. For fear of losing their base of operations in the country, the WHO and other international agencies acquiesced in the Indonesian government's negligent failure to aggressively cull infected birds or to contain the early human outbreaks. Critics of the disastrous and failed campaign were censored and, in the case of the most senior foreign expert on the scene, even purged for leaking details of the fiasco to the international science press. Be more worried, in other words, about the chickens in Java than the turkeys in Suffolk. While it is unnerving to have such a notorious virus unmasked in East Anglia, killer influenza is still most likely to reach London via Heathrow as a result of failed containment efforts elsewhere. Indonesia now appears to believe it may also prove to be a goldmine for the government of the country in which the H5N1 strain appears as well. The Indonesian government has followed through on its threats issued eight days ago to stop sharing samples of the H5N1 virus that has seen the archipelago become the world's leader for human deaths related to avian influenza. There has been 81 confirmed cases of human bird flu infection in Indonesia since rigorous testing was introduced in early 2005. Some 63 of those confirmed infected died from the virus. Indonesia was apparently furious that Australian pharmaceutical giant, CSL, had used samples of Indonesian bird flu to develop a vaccine, now being rushed through Australian approval processes, without permission. Indonesia claimed in late January that it owned the "intellectual property rights" of the virus samples it had shared with some of the world's leading virologists, epidemiologists and the World Health Organisation. A claim of ownership that was, no doubt, greeted with both shock and laughter by the white coat crowd. The news that Indonesia will no longer share the valuable human genetic samples with foreign laboratories has caused dismay and "raised fears it could slow international efforts to prepare for a pandemic." Indonesia's actions are also likely to frustrate the world's leading drug and vaccine manufacturers as well. While it is important to remember that the threat of a global bird flu pandemic, and the need to take action to prevent it from becoming a reality, has already seen almost unprecedented co-operation between the world's biggest drug companies, it must not be forgotten that human bird flu vaccines have the potential to generate tens of billions of dollars worth of sales (even if heavily discounted for poorer nations). The mega-billions generated by the stockpiling of more than 200 million doses of Tamiflu by some 80 countries around the world has indicated the deadly H5N1 virus is a potential goldmine even beyond that of AIDS-related vaccines and 'cures'. Dr Triono Soendoro, director-general of Indonesia’s National Institute of Health Research and Development, said the step to withhold samples was taken because the government wanted to keep control of the intellectual property rights of the deadly strain of the virus. He declined to give further details but said “all will be revealed” on Wednesday, when Indonesian officials are due to announce they are collaborating with Baxter International, the world’s biggest maker of blood-disease products, on a vaccine. Analysts say Indonesia hopes to offer exclusive rights to the strain to one company and cut a deal on cheaper products once they are developed. One official warned that withholding samples could be counterproductive, since there was no guarantee the final human pandemic strain would derive from the current virus killing people in Indonesia. One bird flu expert in Jakarta said the move would not matter if Indonesia was able to do a full sequencing of its strain to detect mutations. “But given the country doesn’t yet have the capability, this is now a very internationally worrying decision,” the expert said. The World Health Organisation has confirmed that a 17 year old girl has died of H5N1 in Egypt, after she is believed to have come into contact with infected poultry. The WHO said the girl was believed to have been infected with a strain of the virus that has shown "moderate" resistance to Tamiflu. She was the 12th person confirmed to have died of the virus in Egypt. A 22 year old woman died in Lagos, Nigeria, on January 17 of H5N1. She, too, is believed to have come into contact with infected poultry. But curiously, the woman is thought to have survived some two weeks after the initial infection before she died. An unusually long survival time between infection and death for a bird flu victim. Her mother also died, but WTO says tests have so far proved negative. The 22 year old woman was the first confirmed victim of bird flu in Nigeria. The avian influenza virus continues to spread across the world as it mutates, showing up for the first time in some countries, while mounting a strong return to Indonesia and also Vietnam, a country held up in 2005 as having successfully eliminated the virus from its poultry and wild birds. Japan and Nigeria have reported a series of cases of the lethal virus, and China, Egypt, Russia, South Korea and Vietnam have also revealed outbreaks in birds and in humans in the past two months. Indonesia began a mass bird cull in the capital city of Jakarta last Wednesday. At least 164 people are now known to have been killed by the disease across the globe. The rapid spread of avian flu can be traced to the fact that the H5N1 virus is mutating as it spreads through birds and a variety of mammals including cats, tigers and pigs, said Robert Webster, a researcher at St Jude Children's Research Hospital, in Memphis, Tennessee. It was revealed last night that five people in Indonesia have died from the virus since the beginning of the year while Japan yesterday confirmed its fourth outbreak of H5N1 bird flu this year and Thailand has reported three outbreaks during the past month. It was the miracle anti-viral drug that could stop a worldwide bird flu pandemic in its tracks, or so dozens of health ministers across the world would have had us believe back in 2004 and 2005. More than 80 governments around the world have spent tens of billions of dollars stockpiling Tamiflu since bird flu began decimating poultry stocks across in Asia in 2003. Manufacturer Roche claims enough Tamiflu was ordered to treat some 200 million people. For the poorest countries, the cost worked out to around $9 per person. For the wealthier nations, the price rose to almost $20, per person, per treatment course. Tamiflu is supposed to last five years, claims Roche, with the proviso that it is "stored properly." So far, the anti-viral has been used to save the lives of perhaps no more than a few dozen people across the world, primarily in Indonesia. But the need for even some of the world's poorest countries to spend millions of dollars on the anti-viral medication was always a 'Just In Case' scenario. Imagine if you were the leader of a country that had had the chance to stockpile Tamiflu, but you chose not to, and then a pandemic struck? You'd have been chased from office, if not strung up in the street. But millions of doses of Tamiflu are now beginning to expire, and countries like Vietnam face a serious, and costly, choice : Should they stock up once again on another few million courses of Tamiflu? Or take their chances and go without? After three years of fighting bird flu, some poor Asian nations must face a painful health dilemma: whether to spend millions of dollars to replace expiring drug stockpiles for a pandemic that may never come. Vietnam, Cambodia and the Philippines will be the first on the front lines to see their stocks of Tamiflu medicine expire by year's end. Countries worldwide have been racing to stockpile the antiviral, which experts hope might help fight a pandemic flu, but no one knows for sure whether it will actually work. Leaders must decide whether to play it safe and restock at great expense or gamble that the H5N1 bird flu virus will never become a mass killer and spend the money on diseases like AIDS or tuberculosis instead. This choice will eventually confront every nation that stockpiled antivirals amid fears that a pandemic was looming. "If the threat lingers for many years, what happens then?" asked Megge Miller, an epidemiologist at the World Health Organization in Cambodia. "It's just (like) throwing money into a black hole." There is some very real fury in England today as it becomes clear that the outbreak of H5N1 on a Suffolk turkey farm, that killed more than 2500 birds, had raged for at least four days before a quarantine zone was imposed around the property. For two days, possibly three, hundreds of farm workers entered and left the infected property as the turkeys died, and there was a risk they were carrying the incredily lethal virus on their clothes and boots. They mingled with people from the local village, dined with friends and family members, and used the local supermarket. But even worse, those workers risked a fast and terrible death simply by being exposed to the faeces and flesh of turkeys that had died from H5N1. If these workers were then infected with the deadly virus, and were carrying other flu strains at the time, there was also a risk that H5N1 could 'breed' with another flu virus to create the theorised pandemic-ready form of bird flu in humans that could become easily transmissable. Tuesday morning, January 30, 2007 : 71 dead birds found on the turkey farm in Suffolk. Wednesday morning, January 31 : 186 turkeys found dead. Thursday morning, February 1 : 860 dead birds discovered. Friday morning, February 2 : More than a thousand more dead birds found. Friday evening, February 2 : Veterinarians from the Department for the Environment, Food & Rural Affairs finally reach Bernard Mathews' turkey farm. Saturday, February 3 : The European Union announces that the blood of dead turkeys from the Suffolk farm reveals the presence of the H5N1 virus, and this is the most likely cause of death for more than 2600 birds in less than 96 hours. Saturday & Sunday, February 3 & 4 : A 2000 square kilometre quarantine zone (of varying levels of confinement) is imposed around the turkey farm, and more than 165,000 poultry birds are euthanised. The birds are gassed, their corpses incinerated. Many of the 1000 workers from the farm are believed to recieve injections that are meant to innoculate them from the H5N1 virus. Even if this outbreak of H5N1 spreads no further than that one turkey farm in Suffolk, the poultry industry in the UK and the EU is already bracing for losses worth hundreds of millions of euros. And there are serious questions being asked about the UK's much vaulted claim to being the world's leader on halting fighting the H5N1 strain of avian influenza. As there well should be. "It's not just a national problem; people in Holland, France, and Germany will all be rather quaking in their shoes as well," said John Oxford, a professor of virology at the Queen Mary School of Medicine, yesterday. And even if nobody dies there are likely to be dire consequences for the poultry industry as a result of the scare. A year ago a wild swan was found with H5N1 in Fife, Scotland, having died at sea and been washed ashore; in May more than 50,000 chickens were culled in Norfolk when some had the H7N3 strain. The National Farmers' Union believes these two stories cost £58m in sales of chicken and turkey meat and related products, as people played safe. Blood from the corpses was sent down to the Veterinary Laboratories Agency in Weybridge, Surrey, one of the leading labs for such work in the world. It was here that the Turkish birds were tested, on behalf of the European Commission. On Friday night the laboratory confirmed that it was avian flu, but did not specify the strain. Then just after 11am yesterday the news that everyone feared was confirmed in an email from the EC: it was H5N1. "There is absolutely no need for panic or hysteria," said Conservative MEP and bird flu expert Neil Parish. But people living close to the farm, which is in open countryside a few miles from the market town of Halesworth, were shocked. "I am worried for people who work at the factory," said Lillian Foreman, 43, of Holton. "What will happen to them? If turkeys started dying on the Tuesday why wasn't Defra notified then?" Yesterday Defra had stopped all but essential movement in and out of the farm, and visitors were being disinfected. Anyone with poultry within 10km (six-miles) of the farm was told to keep them inside and out of the way of wild birds, ensuring water was not shared with them. Birdwatchers at a wetlands area close to the farm were replaced by Defra officials keeping a close eye out for signs of avian flu. Villagers were not confined to their homes, however, as they had feared. "People are coming and going as they please," said Melanie Shenton, landlady of the Lord Nelson Inn, the only pub in the village. "We've seen no officials, only loads of press." The rest of the country wanted answers, too. Reassurances from Defra that the virus had probably been contained inside the farm and would be eradicated by the slaughter did little to prevent fears that it may yet spread. The most pressing question, which scientists were still attempting to answer last night, was where did the virus come from and how did it get inside the turkey shed. The migration of wild birds is the most popular official theory for how the H5N1 virus spreads around the world, although studies of migratory routes and outbreaks don't completely back this theory. The contrary theory is that bird flu is mainly spread by the global trade in chickens, eggs, and other "poultry products" such as manure, and that it flourishes in factory farms. This view has been promoted by bird charities, which have an obvious interest in minimising the culpability of their feathered friends - but it also has some independent support. A year ago research published in the official journal of the US National Academy of Sciences suggested that the trade was mainly to blame for the virus spreading from China to Vietnam and Indonesia, where it has killed the most people. At around the same time a report by an international agricultural pressure group - Genetic Research Action International - concluded: "The deadly H5N1 strain of bird flu is essentially a problem of industrial poultry practices. Its epicentre is the factory farms of China and Southeast Asia ... and its main vector is the transnational poultry industry, which sends the products and wastes of its farms around the world." The report did not deny that wild birds carry the disease, but said that they have it only in a mild form before its gets into the factory farms, which are "then ideal breeding ground" for deadly strains. "Bird flu is not a food safety hazard. If there is any risk to poultry we will remove it. We would advise against any inappropriate hysteria." They didn't specify what exactly was "appropriate hysteria". As vets and scientists tried to trace the source of the country's first infection of the H5N1 strain of the disease, which has killed 164 people in Asia, government scientists sealed off the farm at the centre of the alert. The emergency measures were introduced after tests by the Veterinary Laboratory Agency confirmed that more than 2,000 birds had been killed by the highly pathogenic Asian strain of the H5N1 virus, which is believed most likely to cause harm to humans. The public was urged not to panic. The health of farm workers and their families was being monitored, entry into the site restricted and essential visitors disinfected. Other poultry farmers within a 10km protection zone were told to keep their stock indoors and out of contact with wild flocks, while pigeon races were banned nationwide. Later Defra widened the restriction zone to cover east Suffolk and south east Norfolk. David Miliband's Department of the Environment, Food and Rural Affairs (Defra) admitted that "the likelihood of further geographical spread of the virus is high". It is confident that it can stop the disease from moving from the farm to infect other flocks, but believes there are increasing risks of it arriving through migrating birds, the trade in live birds, and the movement of people. Britain scrambled to contain its first outbreak of the highly pathogenic H5N1 strain of bird flu in domestic poultry on Saturday after the virus was found at a farm run by Europe's biggest turkey producer. "We're in new territory," National Farmers' Union Poultry Board chairman Charles Bourns told Reuters. "We've every confidence in Defra but, until we know how this disease arrived, this is a very apprehensive time for all poultry farmers." Defra said the virus was the same pathogenic Asian strain found last month in Hungary where an outbreak among geese on a farm prompted the slaughter of thousands of birds. That outbreak followed a relative lull in cases of H5N1 among European poultry since hundreds of turkeys died at a farm in east France about a year ago. Avian flu expert Colin Butter of the Institute of Animal Health said the British outbreak was surprising as it had happened outside the main bird migration period. "The next thing we need to know is if this is a primary or secondary case. If this is a secondary case, it is much more serious. If this is the first case, or 'reference case', and we can stamp it out, the outbreak will be controlled," he said. A protection zone was established with a radius of 3 km (2 miles) and a surveillance zone of 10 km around the infected farm. Bird gatherings such as bird shows and pigeon racing were suspended nationwide. Across the North Sea, Norway, which has had no cases of the deadly bird flu strain, responded to the news by ordering farmers to keep poultry indoors in the area south of Nordland county and banned bird gatherings, such as bird shows and competitions. ...new research has revealed that the difference between a flu virus that kills millions, and one that kills only a few comes down to just two amino acid changes. The finding could allow scientists to stay one step ahead of a H5N1 flu pandemic, by screening for the specific mutations that would enable it to spread. A new study investigating the difference between the 1918 pandemic flu virus - which killed at least 50 million people - and a virus which kills but does not spread, turned out to be two small mutations on the virus's surface. Just two amino acids - the building blocks of protein - need to change on the virus's surface in order to allow it to spread easily between people, the researchers found. Haemagglutinin, the main surface protein on flu viruses, binds to sugars on cells in the nose and lungs; the virus then enters the cells and replicates. Bird flu prefers a sugar called 2,3-sialic acid. Flu adapted to mammals attaches better to 2,6-sialic acid. Mammals have the 2,3 sugar deep in their lungs, but 2,6 in the nose and throat. H5N1 prefers 2,3. It had been thought that that was why it causes a devastating deep-lung infection in humans, but does not spread between people, because it does not bind and replicate in the nose. (Ed : But apparently, this is not how the 1918 virus managed to kill so many people). What a virus needs to spread, the CDC team concluded, is an ability to bind 2,6 sugars, whether or not it needs this to replicate. What this binding does do is not clear. One clue, they speculate, is that ferrets with non-contagious viruses - H5N1, or mutant 1918 - do not sneeze. Contagious ferrets do. ...what is important is what this tells us about how the next pandemic might begin. The same mutations that made the 1918 flu contagious will not apply to H5N1, as it has a different haemagglutinin. However, the CDC results suggest finding out what mutations make H5N1 bind to 2,6-sialic, as those could make it contagious. On February 1 & 2, more than 350 of the world's top experts on influeza, pandemic management and disease control met in Arlington, Virginia. There was a lot on the agenda, but the growing fears of a full-blown bird flu pandemic breaking out in the United States, and around the world, was clearly the chief focus. The meeting, "Seasonal & Pandemic Influenza 2007," a follow-up to a similar conference held one year ago, is focusing on the progress made to date in implementing pandemic flu preparedness plans at the national, state, and local levels, as well as in the business sector -- and how far we have yet to go to be ready for bird flu. This year's gathering will examine H5N1 epidemiology and surveillance, pathogenesis and treatment, vaccine development, impact on the health care delivery system, and lessons learned from the 2003 SARS outbreak in Canada. The meeting will also review the national response to seasonal flu in the U.S. -- less-feared than bird flu but currently a cause of greater morbidity and mortality. "The pace of human H5N1 infections is accelerating but our plans to prepare for bird flu on a massive scale are moving at business-as-usual speed," said Richard Whitley, MD, co-director of the Center for Emerging Infections and Emergency Preparedness at the University of Alabama at Birmingham and meeting co-chair. "We don't want to cause bird flu panic, but we do need to have a sense of urgency as we move forward to respond to this public health challenge of potentially catastrophic proportions." At a Senate hearing last week, the director of the Centers for Disease Control and Prevention, Julie Gerberding, MD, MPH, echoed this concern and urged states to ramp up preparations for bird flu by conducting state-wide simulations of pandemic scenarios. When 1000 turkeys dropped dead, virtually overnight on a Suffolk turkey farm less than two days ago, it was suspected the avian influenza strain involved in the deaths would turn out to be the extremely lethal H5N1 strain. And now it has been confirmed. Plus, it isn't just any old turkey farm that has been infected with bird flu. It's the biggest farm in all of Europe. Extremely bad news. The death toll at the Suffolk turkey farm has already reached 2500 dead birds, more are expected to die. The European Commission on Saturday confirmed that an outbreak of bird flu on a farm in eastern England was the H5N1 strain. The outbreak on a farm run by Europe's biggest turkey manufacturer Bernard Matthews has killed 2,500 birds, government officials said. Government veterinary experts were called to the farm near Lowestoft in eastern England late on Thursday. "All poultry farmers are in shock as we had no inkling that is had suddenly turned up in England," National Farmers' Union Poultry Board chairman Charles Bourns told Reuters. "The last time sales dropped between two to three percent, but it was enough to affect the market place as there was a lot of discounting." The farm has 160,000 turkeys, but only one of the 22 sheds that house the birds has so far been affected by the outbreak. In May, 50,000 chickens at three farms in Norfolk, also in eastern England -- home to some of Europe's biggest poultry farms -- were culled and disposed of after the H7N3 strain of bird flu was detected. A wild swan found dead in Scotland in March 2006 had the highly pathogenic H5N1 version of the bird flu virus which can kill humans. It was thought to have caught the disease elsewhere, died at sea and been washed ashore in Scotland. Bourns said those two scares cost the British poultry industry 58 million pounds ($115 million) in 2006. There will now be a massive cull of most, if not all, the turkeys on the Suffolk farm. It remains to be seen if this outbreak will frighten Brits off poultry, further damaging the industry. I'm not a virologist, or epidemiologist, just an interested blogger, but if migratory birds are ruled out, and any birds in general that might have visited the farm, as being responsible for passing on the H5N1 virus to these turkeys, the authorities will probably start looking into the possibility of infected feral cats having passed on the virus. But that's only a mildly-educated guess for now. The H5 strain of avian influenza makes an unwelcome return to Britain. Test results pending on whether the virus that killed 1000 turkeys in Suffolk is the far more lethal H5N1 strain. An outbreak of bird flu at a turkey farm in Suffolk has killed more than 1,000 birds, the Department for Environment, Food and Rural Affairs said last night. Preliminary tests at a Bernard Matthews farm in Holton, near Lowestoft, where there are three factories, found traces of the H5 virus in the poultry. Further tests are necessary to determine whether it is the H5N1 strain, which can be deadly to humans, a spokesman said. Government vets were called to the site late on Thursday after hundreds of birds showed signs of illness that included going off their food and general malaise, symptoms associated with bird flu. A Defra spokesman that the farmer had noticed "significant mortality" among his flock and that the site had been placed under restrictions. In May, 50,000 chickens were culled after an outbreak of the H7 bird flu in Norfolk. In April, a poultry worker contracted H7 in the form of conjunctivitis - he is thought to have caught it on the Norfolk farm where the disease was discovered. A swan found washed up in a Scottish bay in March tested positive for H5N1. Last month the Department of Health announced that thousands of poultry workers are to be offered free influenza jabs in an attempt to stop new forms of bird flu emerging. The New York Times story we linked to in our last post, about the US government's new categorisation system for flu pandemics, also contains some fascinating insights into how the 1918 Spanish Flu pandemic was fought in towns and cities across the United States. The Centre For Disease Control and the University of Michigan's medical school conducted a study into how 44 American cities coped with the Spanish Flu outbreaks. Newspaper clippings form the era, and hospital records, were examined, to find out why some American cities were devastated by the outbreaks, and others managed to control them. While a few tiny towns escaped the epidemic entirely by cutting off all contact with outside, most cities took less drastic measures. These included isolating the sick and quarantining homes and rooming houses, closing schools, churches, bars and other gathering places, canceling parades, ball games, theaters and other public events, staggering factory hours, barring door-to-door sales, discouraging the use of public transport and encouraging the use of face masks. The most effective measure seemed to be moving early and quickly. For example, said Dr. Howard Markel, a medical historian and one of the study’s leaders, Philadelphia, the worst-hit city, had nearly three times as many sick and dead per capita as St. Louis, which had was hit weeks later by the virus moving inland from the Eastern Seaboard and had time to react as soon as flu cases rose above averages. The latest plan unveiled by the US government on how they plan to fight a full blown flu pandemic, bird flu and otherwise, reveals just how seriously the agencies concerned view the lack of concern expressed by the average American to a threat a thousand times greater than the worst terrorism scenario ever envisaged. The Bush administration has decided to ramp up its 'marketing' campaign of raising awareness of the true threat posed by a bird flu pandemic amongst the human population through a series of new reports, and a dramatic new categorisation system, similar to that used to describe, in simple language, the danger posed by hurricanes. In this case, the US govenrment's Centre For Disease Control and Prevention, has created a far more user-friendly (it's the right term, but it sounds so wrong) Category 1 to Category 5 system to describe the threat posed by flu pandemics. A Category 1 or 2 hurricane is understood by virtually everyone to mean that you can still walk down the shops, but your hat might get blown away. While a Category Five hurricane announcement makes people go weak at the knees and sprint to the basement, with a child under one arm and the family pet under the other. So along with the usual warnings about how businesses could grind to a halt, and how hospitals will become overwhelmed with the sick and the dying, if or when a flu pandemic hits (bird flu or something else altogether), we are now going to be hearing a lot more about Category One or Category pandemics. The category 1 to 5 ratings will be based on the potential, and likely, lethality of the flu virus on the kill across the United States. So hopefully the words "Category Five Pandemic" will never be heard. Because if you hear an official say "We've got a Category Five Pandemic breaking out," well, it's going to be like something out of Revelation. Armageddon, if you like. It'll be interesting to see how quickly other countries already up on their bird flu pandemic preventions, like Australia and Indonesia, will adapt this categorisation system. So here's the 'lethality' rundown. Category 1 signifies around 90,000 Americans will die. That's only three times the number of people a normal American flu season wipes out. But a Category 5 signifies that something beyond 1.8 million Americans will die, within months. But here's the nightmare scenario : Spanish Flu in the US, killed about 2% of everyone it infected. Whereas, the avian influenza virus in humans (or H5N1, or bird flu) is clocking up a death rate of more than 50% of those infected. In Indonesia, at least, that lethality rating can go as high as 70% or 80%. So the World Health Organisation estimate of 2005 that claimed a worldwide bird flu pandemic in humans could kill 200 million might not be so far off the mark, after all. Don't ever believe that humans rule this planet. And the king-killer of all viruses is the flu. The worst virus yet seen was Spanish Flu. But H5N1 bird flu may yet even top that decimation of humanity. A vaccine that could stop humans from becoming infected, upon exposure, to the H5N1 strain was always going to be a gold mine for the pharmaceutical manufacturer, maybe even more of a profit-generator than the shockingly expensive AIDS medications now being bootlegged in India and across parts of South East Asia. The first sign of coming legal battles over who "owns" deadly strains of avian influenza has now been seen. The Indonesian Government says Australian company CSL should have sought its permission to develop a bird flu vaccine using the Indonesian strain of the H5N1 virus. The death told from bird flu in Indonesia stands at 62 and authorities are preparing to enforce strict controls on people raising poultry. Sweeps begin across Jakarta today to capture and kill any backyard birds not already handed over to authorities. But news this week that the Australian pharmaceuticals company CSL had developed a vaccine against the H5N1 bird flu virus was met with alarm by Indonesian Health Minister Siti Fadillah Supari. He says Indonesia is seeking intellectual property rights over the Indonesian strain of the virus on which the vaccine is based. But CSL spokeswoman, Dr Rachel David, says it is not possible to "own" strains of bird flu. Dr David also says the vaccine is not being developed for commercial purposes. "If, and only if, a pandemic flu was to become a problem, that particular amount of money in that contract is fixed," she said. "It's not something we can profiteer out of and in fact it's not something that we see as being a commercial exercise at all." Dr David has refused to do further media interviews on the advice of the Australian Government, which says it is a diplomatic matter. Two very interesting points from this story are CSL's claims that they do not view a bird flu vaccine as being "a commercial exercise." The Australian government funded the first round of CSL's development of their claimed successful vaccine at a cost of around $8 million, relatively small change compared to what the Australian government has spent, or has committed to spending, on stockpiling anti-virals - at least $200 million. The second quite bizarre point to be highlighted is that CSL will no longer do media interviews on the advice of the federal government. This sounds like the government has basically told the company to shut up about a vaccine that the government used taxpayers money to fund the development of. There has been much debate over the past few years about where the predicted human bird flu pandemic will originate. China and Indonesia are usually cited by the media, but it seems that many virologists and bird flu experts fear that Africa will the birthplace of a pandemic that could claim the lives of hundreds of millions of people. So far, sub-Saharan Africa has had relatively few outbreaks of avian influenza amongst wild birds and poultry, partly due to fast action by international agencies and co-operative governments, who clearly understand the threat that H5N1 poses. But Nigeria has now announced its first official human bird flu victim - a woman from Lagos State. Results from three others who may have died of bird flu have been deemed, for now, "inconclusive". Mr. Abdulsalam Nasidi, a bird flu expert at the health ministry in Abuja, said the three inconclusive cases were the mother of the confirmed case in Lagos, a poultry worker in Taraba State and one person in Borno State. The woman from Lagos State is the first confirmed human victim of bird flu in sub-Saharan Africa, after the deadly disease was first found in poultry in Nigeria a year ago. “Last night, our team of 13 scientists were able to conclusively identify the case of avian influenza in a 22-year-old female who died in Lagos,” Frank Nweke, Information Minister, told a news conference in Abuja. The woman was one of 14 people, three of whom died, from whom samples were taken for tests. Samples are now being sent to foreign laboratories for confirmation. Nigeria is one of three countries regarded by experts as the weakest areas in the global attempt to stem the spread of the virus.